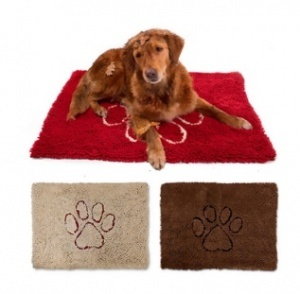 The Dirty Dog Doormat from Dog Gone Smart soaks up mud and dirt keeping floors clean and dry. This amazing microfibre doormat soaks up to 7 times its weight in water and mud. Perfect for big muddy paws! It dries 5 times faster than ordinary door mats and has a super gripper backing so it doesn't slide around on hard floors. Machine washable to keep it looking great. The Advanced Microfiber Technology traps water and mud instantly. Millions of soft microfiber strands create an extra large super-sponge. For use just about anywhere! Can be used in crates and under food and water bowls. Protects your home from unwanted hair dirt and slobber!